I picked up this bottle at Majestic for no better reason that the label cheered me up. I’d not long returned from a fabulous week walking around the royal and not so royal gardens of Seville and found myself in a cold, dark, rainy English evening. For the avoidance of doubt, I do know that Seville is in the south of Spain, and this wine comes from the south of France, but all the same, the label reminded be of the Real Alcázar of Seville (perhaps better known to you as the Water Gardens of Dorne in Game of Thrones) and the ridiculously lovely Parque de Maria Louisa. My rather shabby looking, overgrown garden, soaking wet with rain wasn’t doing it for me. I wasn’t expecting a lot from it, it was £8, so my wistfulness had not cost me a fortune. 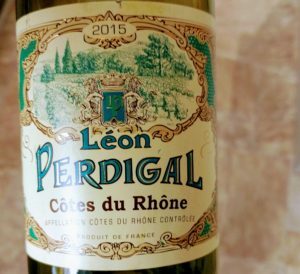 This Léon Perdigal Côtes-du-Rhône Blanc ’15 has a full on hipster collection of grapes in it: Bourboulenc, Clairette, Grenache Blanc, Roussanne & Viognier. So cool you’ve never heard of half of them. It doesn’t hold any truck with oak either so the grapes get to do all the talking. It’s a cheering lemony yellow and it smells of apricot blossom and honeysuckle. I may have just been drifting off into the gardens, but there was no scent of orange blossom so maybe not. It tasted dry, properly, fully dry, with a crisp bright acidity. That apricot flavour carried through and did bring some citrus with it, grapefruit and lemon as well as a bit of green apple. There was something else too, a slightly yeasty, bready note that wasn’t quite biscuit, more fresh baked soft flaky croissant or brioche. All that taste worked with with an alcohol level that was just at the upper end of medium,mixed with that yeast gave it a smooth mouthfeel. I was pleasantly surprised, it certainly tasted like more than £8 worth of wine and if I’d checked the receipt to see it had cost £10-12 I wouldn’t have been shocked. If you happen to be heading to Calais, I hear Majestic knock it out there in three litre boxes. I’m not sure whether the box would keep it as well as the bottle, but I guess you could just drink it quick!